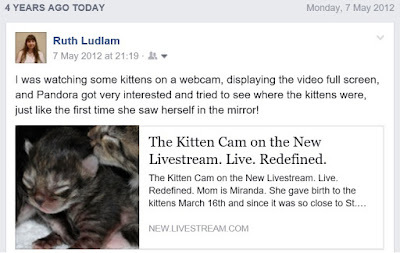 Today is the four year anniversary of my watching livestreaming kitten cams. This seems like a good opportunity to write about what the experience has meant to me. I first came across a link to the very first kitten cam, Foster Dad John's cam showing Miranda and her four kittens, on Boing Boing. As a cat lover, I was intrigued by the idea of being able to watch kittens live. My cats were no longer kittens, and watching in real time seemed like a more authentic experience than watching short, edited videos people had chosen to make of their cats. Of course, it helped that these happened to be very beautiful tabbies! Here's a webcam site where you can watch four tabby kittens and their mother playing! If there's nothing happening on the Live stream, scroll back on the scroll bar to see what was recorded earlier. Yesterday Pandora was watching with me and sniffing around the screen trying to find the kittens! Eventually she realized they weren't really in the room. It was like the first time she saw her reflection in the mirror. 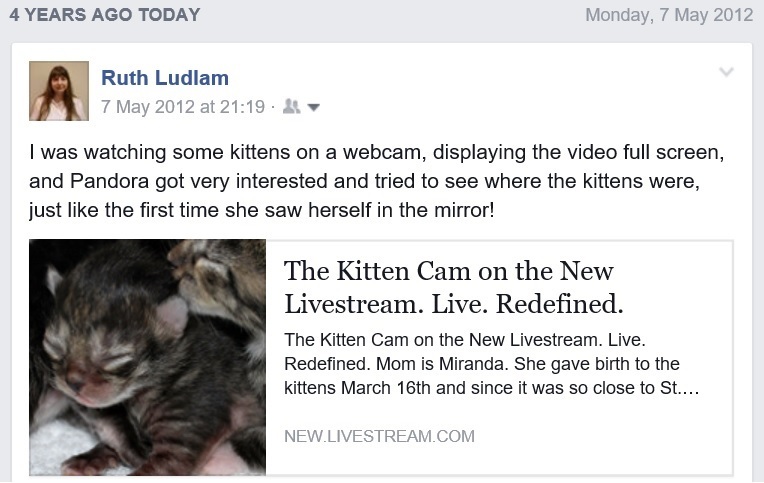 This was my introduction to the world of kitten cams, which has been part of my daily life ever since. Foster Dad John started the first kitten cam so he could watch his fosters while he was at work, and decided other people might also enjoy watching them. When the cam was noticed by sites like Boing Boing it gained popularity, and over the years it has had hundreds, thousands, and at some times tens of thousands of people watching at any given time. 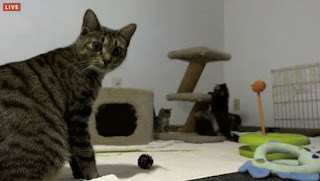 Other foster care providers started their own cams, and I currently follow three of them: Foster Dad John, Shelly Roche's TinyKittens, and Sarah's Kitten Cuddle Room. Thousands of viewers watch the various cams, from all over the world, and each person benefits from watching in individual ways. Here's what watching kitten cams has done for me. First, and most obviously, cats and kittens are fun to watch. There is even scientific research that watching cat videos is good for your health. I find watching kittens to be calming and happiness-inducing. Being able to watch happy kittens also helped me through my cat Pandora's illness and death in December 2014. Second, it's educational. I have learned so much about cats from watching the cams. I've been exposed to different types of cat behaviour and health issues, and the foster care providers are dedicated to educating their viewers about what is seen on their cams. On TinyKittens I have seen cats give birth, an experience that would otherwise never have been part of my life. On all the cams I've seen how to treat various health conditions, and have watched cats and kittens recover. Sadly, sometimes there are kittens who die, either at birth or shortly afterward, from innate conditions, or even after adoption from various illnesses. This is part of the cycle of life, and viewers have to acquire the strength to accept these losses along with the joy they receive most of the time. Third, it has raised awareness about the importance of spaying and neutering not only our own pets but also feral cats. I have long been aware of trap-neuter-return (TNR) programs for colonies of feral cats, and enjoy seeing the local ferals in my city, with their clipped ears indicating that they have been spayed or neutered. Fourth, it has encouraged my involvement with a local no-kill rescue organization. For years I had been buying calendars from Let the Animals Live, and donating money to them, and since watching the cams I have increased my donations and attended a conference they organized. I also donate to the rescues associated with the cams I watch, but I believe we should always act locally. Fifth, I find great inspiration in watching the foster care providers on cam. John has been a role model from the very start, with his quiet compassion, his endless patience, and his gentleness. Shelly has started a much more ambitious rescue organization, and her work with feral cats and with Cassidy goes way beyond just fostering for a rescue. Sarah's cam might have fewer viewers than the others, but those who watch know that she works wonders with her cats. All three of them are sensitive but strong, compassionate but practical, and put the cats' needs first. The cams show very clearly that each cat is an individual with a distinct personality. When choosing a cat to adopt, it is wise to think not only about the cat's appearance but also about things like personality and behaviour. This is why it can be better, in some cases, to adopt adult cats rather than kittens who are still forming their personalities. I have been deeply moved by the way the foster care providers' love and kindness can change timid cats into purring, friendly companions. There have been some remarkable stories of stray and feral cats transformed into house pets, and since all my cats have been former ferals I have rescued myself, I am glad that others around the world are learning from the cams that this is possible. Again, this depends on individual personalities, and some ferals will never change enough to live indoors. When Shelly returns a feral cat to the forest colony, at least we know that the cat has been spayed or neutered and will receive daily food and shelter at the feeding station. The kitten cams provide a real, uncensored view of fostering, and encourage a long-term commitment to learning about cats and their lives. People with short attention spans can get their cat fix from brief, edited videos. I, however, appreciate being able to follow these cats and kittens for the two months or more that they are on the cam, get to know them as individuals, and later get updates about some of them on Facebook. This is a bit like my preference for reading novels rather than short stories, or listening to entire albums rather than individual songs, or talking to long-term friends rather than strangers. Finally, watching the kitten cams has inspired me to write about cats, both here in my blog, and a larger project I will tell you about later. I see writing about cats and sharing what I have learned over the years as a calling and a privilege, and I hope my words will help educate, enlighten, and entertain readers in a way similar to that of the kitten cams. This is my way of paying forward the good the cams have done in my life. Thanks for this. I've seen several live kitten site (love Shelley, and especially the Cassidy story), but I've never caught the bug. This might give it to me. I know I cou;dn't do that. I get tired of watching live cams. I rarely watch videos on youtube even funny ones. I prefer movies! I am glad there are people though who care about animals so much and do so much about them!AriadnefromGreece!